Visa is giving its shareholders a generous-looking payout raise, but there's a small caveat. Everyone appreciates credit card perks like bonus miles and cash back. Investors in the sector's top businesses, though, earn even nicer benefits -- shareholder dividends. Recently, one of the big names in the credit card industry emphasized that particular extra by lifting its annual payout by 19%. That's certainly good news for its shareholders, however there's an important "but" to bear in mind. 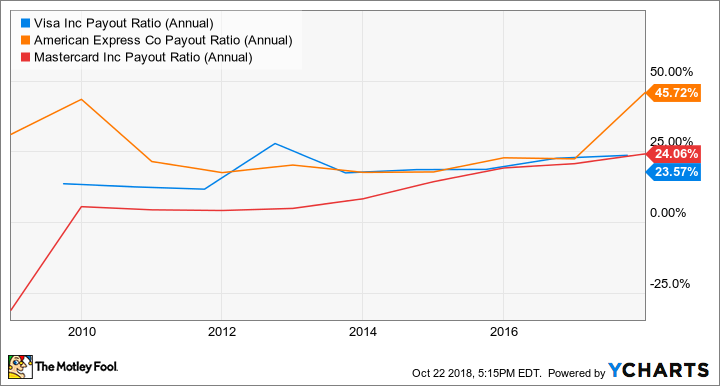 The dividend raiser is the King of Payment Cards, mighty Visa (NYSE:V), which declared that its next quarterly payout will be $0.25 per share, up from $0.21 last time. The new dividend will be distributed on Dec. 4 to shareholders of record as of Nov. 16. Visa has numerous tailwinds propelling it forward. As the operator of the world's largest card payment network, it has been a huge beneficiary of the inexorable shift away from cash and toward digital payments. Let's face it -- do you ever walk around with wads of cash these days? Does anyone you know? More likely, you and your gang pay for nearly every purchase with cards, or by using an app such as Chase Pay. The years-long upward trajectory of the U.S. economy has also helped Visa, as has the mushrooms-after-the-rain proliferation of e-commerce sites. All in all, times are good for top-tier payment card purveyors -- a class that also includes Mastercard (NYSE:MA) and American Express (NYSE:AXP). Visa has been crushing it in terms of financials for quite some time now. In the company's last quarter, it increased revenue by 15% on a year-over-year basis to $5.2 billion, while adjusted per-share net income ballooned by 39% to $1.20. Those are hefty increases for such a large and well-established company. All that said, a big asterisk has to be placed next to Visa's 19% dividend hike. Even with that impressive-looking boost, it still won't pay out much relative to its share price. At the most recent closing, its yield was just over 0.7%. By comparison, the average yield of its fellow dividend-paying S&P 500 stocks is 1.9%. To be fair to Visa, the broader payment card industry isn't exactly a fountain of rich dividend payouts. Visa's 0.7% yield is close to the 0.5% of Mastercard (although that company will probably declare its own hike soon, as is its once-per-year habit). American Express, while more generous, also comes in under that S&P average with a 1.5% yield. It's not like these companies are hurting for money, either. All have generally been profitable, often richly so, for years, and all have the free cash flow to make larger distributions. Just look at how low their payout ratios have typically been. Rather than distributing cash to shareholders, all three of these card all-stars have tended to favor spending it on acquisitions (Visa Europe was a particularly massive one for Visa), or on high levels of share repurchases. Visa, in particular, is extremely fond of buybacks. Sure, a nearly 20% raise in any dividend is cause for celebration. But current Visa shareholders and those considering adding it to their portfolios should be aware that this is not a company that will put a lot of coin directly in their pockets. In this sector, you're investing to get a piece of the future of commerce -- not to reap a chunky dividend. I'm bullish about Visa specifically, and the payment card space generally. I feel that this company is well poised to take advantage of the huge opportunities ahead of it. I just don't expect it to make anybody rich purely through its dividend payouts.